What is the best cut of your application or service? How fine-grained you want your services to be? We would say whatever gives the developers freedom of action and the ability to adopt – “You build it, You run it” model. With Cloud, DevOps & Containers, enterprises are able to modernize their IT, resulting in improved infrastructure efficiency and faster application delivery. Even though most IT organizations gained considerable increase in the speed at which they delivered business value, the ROI is still sub-optimal. The sub-optimal ROI can be traced back to their underlying application architecture which is monolithic in nature and scales differently (sub-optimal) than the underlying elastic infrastructure. Microservices, a suite of modular set of services architected around a business capability or function, is the next frontier in enterprise modernization journey to deliver optimal benefits from the advances of modern IT infrastructure. Microservices architecture goes beyond the needs of enterprise agility and serves as a foundation for IoT, Big Data and other modern application use cases. Embracing Microservices for newer applications is the most convenient starting point for the transformation journey, but it is also important to have a strategy in place so that other legacy monolithic applications are re-architected in due course. Microservices architecture is not the magic pill that can completely transform IT overnight to be part of the core innovation team. 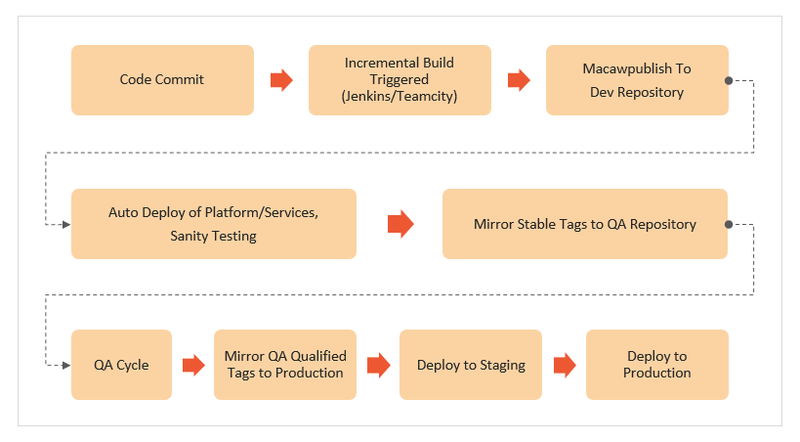 Even though Microservices offer some key advantages in the IT transformation journey, there are some key challenges or obstacles that need to be addressed before realizing the benefits of this architecture. 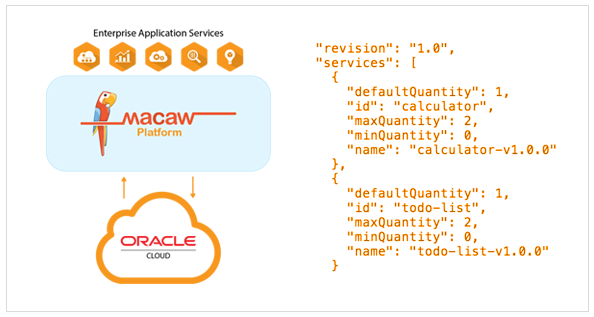 Macaw Software and Oracle Cloud together removes major obstacles to develop and roll out Enterprise Grade Microservices based applications at a rapid pace. This partnership promotes unique benefits that both software providers can create, execute, and compel to the market in tandem. Here’s a dive into the innovation brought forth by Macaw and Oracle to address major obstacles. When it comes to Microservices platform, most of the industry discussions center around the programming frameworks that help developers create Microservices. But a true enterprise grade Microservices platform capabilities should go well beyond the programming frameworks and it should consider the entire lifecycle of developing and deploying Microservices. Without any support for deployment and management of Microservices, the platform offers limited benefits and it may end up increasing the costs and impacting the agility. With Macaw’s turnkey capabilities, rapid deployment and tight integration with industry leading Oracle services including databases, business services, IaaS and PaaS, enterprises will be freed from a complex tool setup and tricky integrations required to build distributed enterprise applications. With so many services and a fluid perimeter, managing the security and governance are difficult compared to traditional IT. It is very hard to manage and govern microservices based applications without built-in Governance capabilities. Most often enterprises have to expend a large amount of time to setup platforms even to do a simple POC. Macaw and Oracle makes this process seamless and also offer a $300 credit to try the platform without any risk. Its in-box Multi-Tenancy capabilities allow enterprises to define policies by projects, roles and ensure they are enforced consistently. Microservices are distributed applications by design. Distributed applications are difficult to debug and identifying performance bottlenecks become a hassle as communication happens across host boundaries and application logs are also distributed across host boundaries. Macaw has built-in centralized logging and search capabilities to help debug issues quickly. Message correlation and fine-grained analytics of each hop allows DevOps to pinpoint performance bottlenecks easily. Macaw’s built-in Micro Analytics support makes it easy to build custom analytics to address any enterprise specific challenges. With Macaw’s high throughput message bus architecture and Oracle’s highly scalable cloud infrastructure, operations teams can be assured of supporting ever evolving and growing business needs. Macaw utilizes highly scalable and high throughput message bus infrastructure. Oracle as a leading cloud provider delivers highly elastic infrastructure support. Macaw provides policy based approval injections to govern costs while allowing rapid infrastructure provisioning. Cloud computing ushered in the era of on-demand computing and freed up IT from the burden of procuring and managing hardware. However, DevOps teams still have a need for stringent provisioning policy to ensure consistent delivery of for resources to ensure application run time requirements. 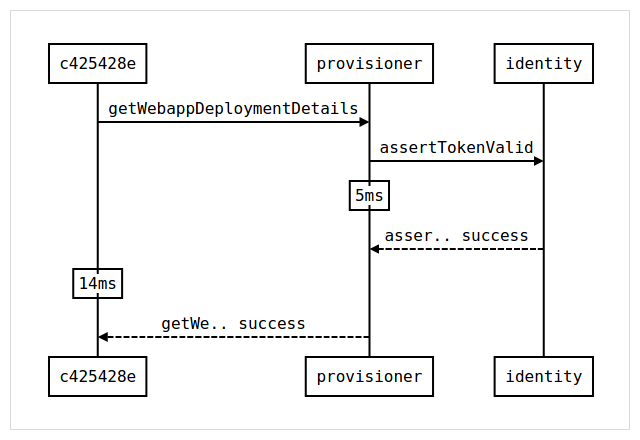 Macaw Blueprints allow DevOps teams to design operations controls and policies using abstract models which in-turn can be reused across clouds. DevOps are extricated completely from managing the infrastructure elements and their configurations. On-demand and auto scaling capabilities allow scheduling of Microservices based on policies and events using built-in orchestration capabilities and underlying Oracle infrastructure. Macaw provides various built-in and readily usable core application services such as database, security, messaging, registry, API gateway and load-balancer/HA, that are essential for rapid development and turn-key operations. Using extensible Macaw platform SDK, new Microservices can be developed in their preferred programming language. The extensive Oracle portfolio of services can be easily accessed by extending the SDK or by using readily available partner integrations. Many developers were able to build and deploy Microservices in the matter of hours during Macawthon (Microservices Hackathon) events. With Macaw and Oracle Cloud integrated solution, enterprises can focus on delivering business-oriented Microservices instead of allocating and investing time and resources on platform and support services. Embracing Microservices is a critical part of Modern Enterprise journey and it goes beyond the architectural considerations of the application. Microservices model brings with it both technical and cultural changes inside the organization, enabling smaller teams with common goals to innovate faster and at scale. Microservices architecture is certainly not the magic pill, but can be magical once Enterprises find the way to cross the Microservices Chasm.